This is a story of Karna Bahadur Danuwar aged 51, a physically disabled person residing in Indrawati Rural Municipality-12, Bhimtar who got rapid transformation in the living condition through commercial farming supported by SAPPROS Nepal in partnership with CBM. Karna was living happily with his wife, three daughters and a son. He owns three ropanies of land in which he cultivated rice, potato, blackgram, mustard and maize. Before the earthquake, he was engaged in subsistence farming and had also some livestock. But, the devastating Nepal earthquake of April, 2015 left him empty handed with no shelter and grains within no time. All the animals were killed by earthquake and his house got completely destroyed. His bad days were not over yet. He met with a bus accident in Sanga Chowk, Chautara in which he got severe injury in his legs, back bone and his entire body was affected. He has steel rods in his right leg. He was known as ‘Kholte’ in his community as he uses crutch to walk. His only son also got injury in his backbone in the same accident. The boy could not sit or stand for a quite some time and do hard/heavy works. Both were immediately taken to Dhulikhel hospital and treatment is going on. Karna was supported with one polyhouse for tomato cultivation and seeds for open field vegetable cultivation. He had participated in various training programs like saving and credit, vegetable cultivation, farm-yard manure, post-harvest technology, polyhouse etc. His family is very supportive to him.Though he showed interest in vegetable farming, there was insufficient water for irrigation within the area. For this, the project further constructed water harvesting tank in nearby field (Battar, Bhimtar) which irrigates 20 ropanies of agricultural land providing direct benefit to 30 households. With this, within a year, he earned NRs. 98,100 from vegetable production. He sold vegetables in Sipaghat market, shops in Bhimtar, in the community and to Shree Bhimeswori School, Bhimtar. Within a span of 8 months, Karna has got rapid transformation in his livelihood through farming. He has turned himself into a leading commercial farmer within a short span of time. 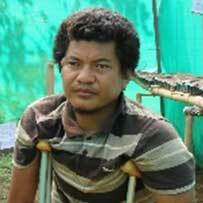 He has been a source of inspiration to the earthquake affected persons and people with disability. His neighbors praise him for his dedication in his work which proves that even a person with disability can do commercial agriculture activities provided strong commitment and support is there. Now a days people have positive attitude towards a person with disability in his community. Sindhupalchok is one of the mostly affected districts by the earthquake. In the same district, 25 years old Aryan Tamang lives in Pyughar-5, Badegaun of Indrawati Rural Municipality. He was grown in Tamang community where community was moving forward in low pace of development. While pursuing his Bachelors degree, he was in search of employment. After continuous search for the job in Kathmandu, he finally found a job. 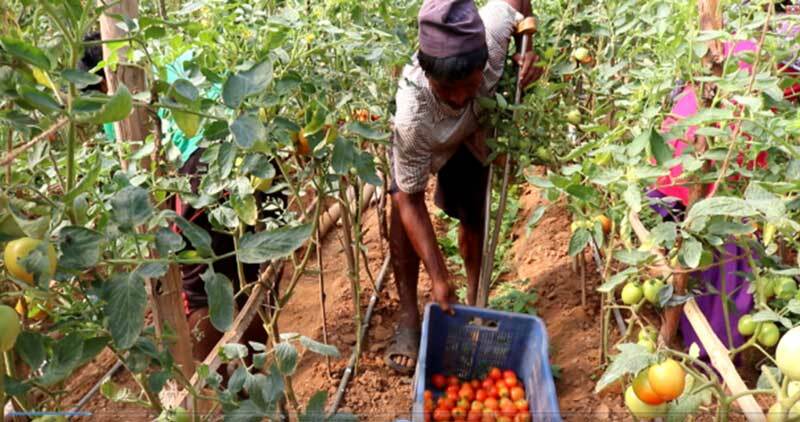 He recalls, “It was hardly enough to pay the room rent and food from my income.” He returned home and engaged in farming but the income was still low. 2015 earthquake make them homeless which further his heart broke. Tamang was looking for opportunity that could change his life. Finally, his wait is over and he is now a part of livelihood project implemented by SAPPROS Nepal in partnership with CAFOD & Trocaire. He was involved in Namonarayan Krisak Samuha (SHG) formed by SAPPROS Nepal. 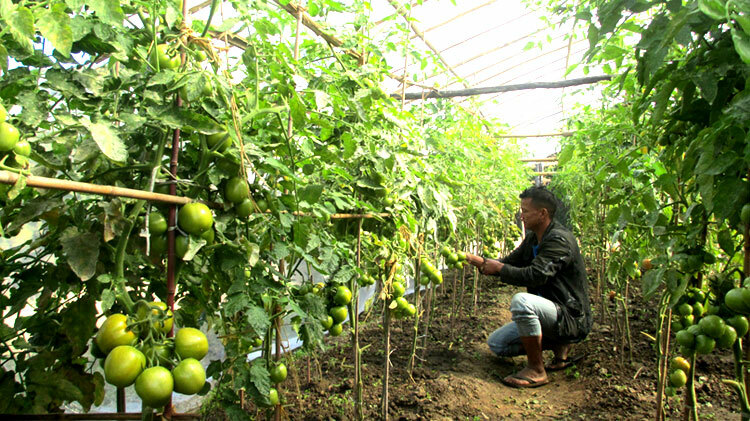 He built a plastic tunnel for commercial vegetable cultivation. 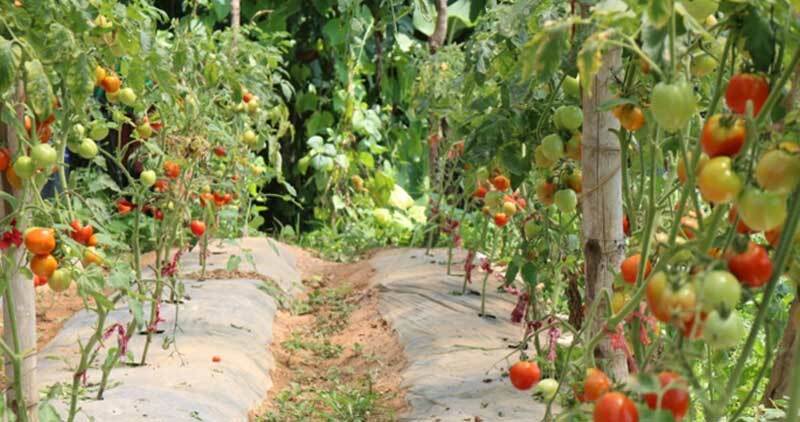 He now grows tomatoes in his tunnel and also cultivates seasonal vegetable in his farms. The vegetables grown from his farm are sold in the village itself. The opportunity of the exposure visit organized by SAPROS Nepal further expanded his knowledge in income generation.He shared his experiences from the exposure visit in the SHG during the meetings. Tamang has cash in his hand every day from the sale of vegetables. He has earned Rs. 90,000 from the vegetable farming within 2 seasons and production is still continuing. He is slowly rising and community out of poverty. The income from the vegetable farming meets his household expenses and — some income for expanding his business. 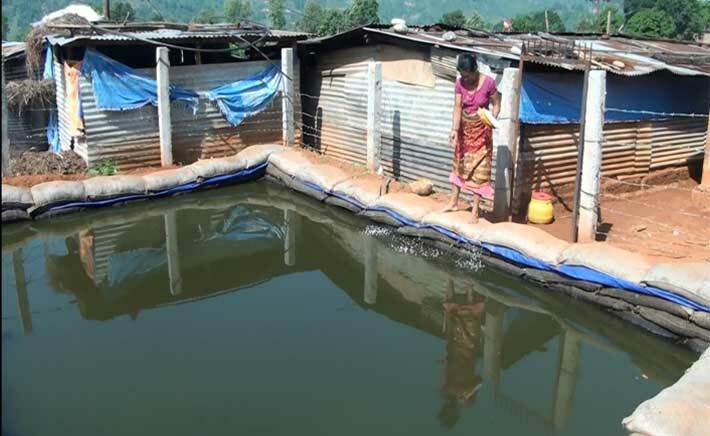 He has also built fish pond with 200 —-capacity fish pond for fish farming. As he constructed pond, SAPPROS provided him 200 fingerlings for fish farming. “When I was idle, lots of negative thoughts came and I was frustrated. After my involvement in the commercial farming I have been busy working in the farm and finding new ways to increase my income. I am filled with positive vibes,” adds Tamang. 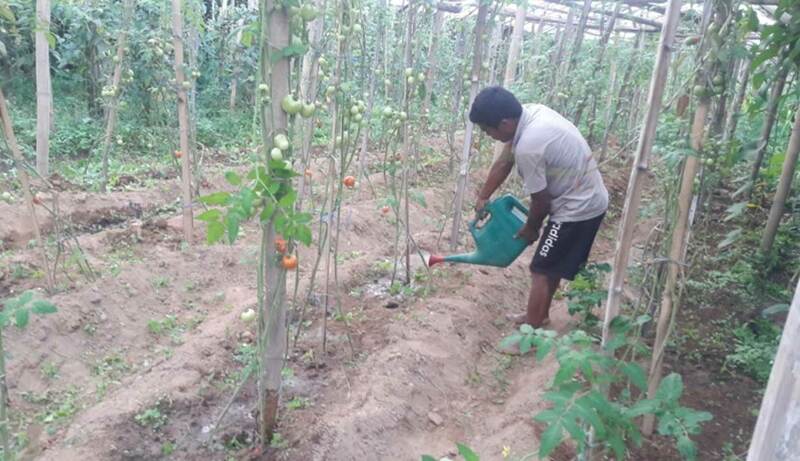 His business has even provided continuous employment to his family members too.It has benefitted not only to his family but also to community members as they don’t have to travel to far off market to buy vegetables.“Commercial vegetable farming can be the best idea for youths like us to secure future of the family and children. I have earned the name and fame,” says Tamang with confidence. “Thanks to SAPPROS Nepal and CAFOD & Trocaire for empowering me enough and making me capable to improve my livelihood status,” Tamang concludes. 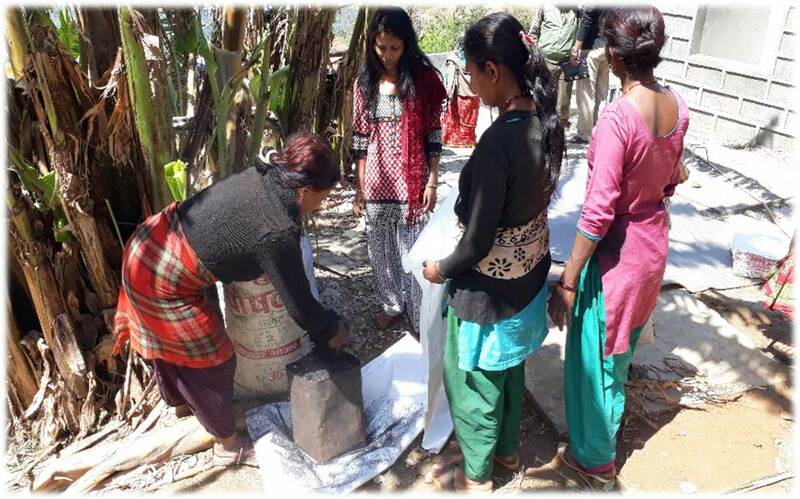 After a year of earthquake, SAPPROS Nepal entered the village with a livelihood enhancement package after the earthquake with the support of CAFOD & Trocaire. Danuwar was joined Panchakanya self-help group formed by SAPPROS Nepal. He was supported with plastic water harvesting tank initially. He kept 500 fingerlings in the pond. Later, as he showed Interest for fish farming and continued business, he was provided with 500 fingerlings in next lot by SAPPROS Nepal. In order to enhance his capacity SAPPROS again provided 2 days Fish farming training. He says, “Before training, I used to give feed in high amount and also I used to buy feed but now I am giving feed in small amount at different time intervals as taught in the training, also I prepared feed myself by using cereals available in home, the result is quite amazing.” Further he adds, “I earned NPR. 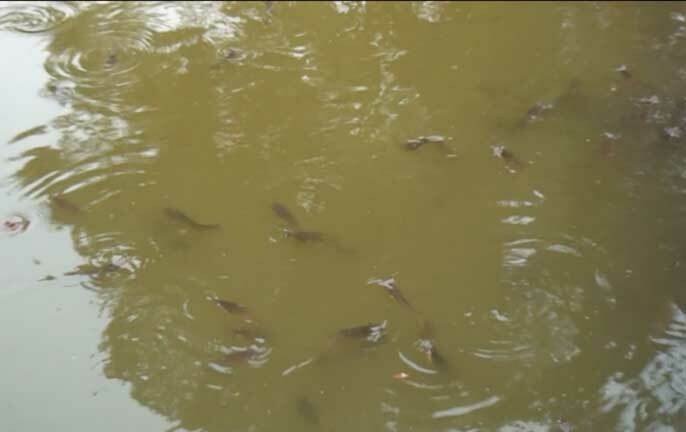 75,000 from fish farming within 6 months and it is helping me to cover household expenses and also educate my son.” Fish farming can be used as extra source of income. 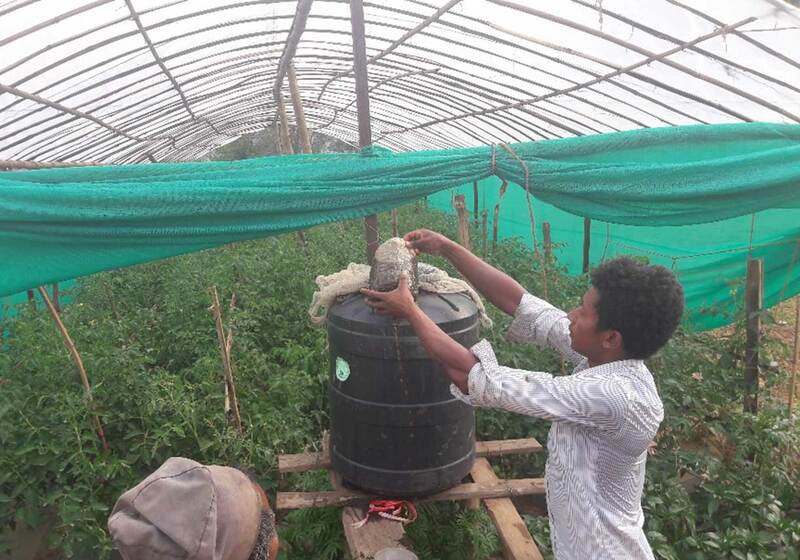 Danuwar says, “It is easy business which can be done in spare time too.” He is planning to enter into vegetable cultivation business by using the water from fish farming tank in future in commercial scale. “ SAPPROS Nepal and CAFOD & Trocaire have given us great opportunity to learn new ideas, skill and technology which is helping us to make our life better,” says Danuwar. Hari Prasad Dahal aged 51 is one of the hardworking farmers of Bimire, Indrawati Municipality of Sindhupalchok district living with 3 members in his family. His wife and youngest son are mentally disabled. His youngest son has autism.He lost his mother and father since his childhood and he was grown up with his elder brother. He had completed his study up to 5th grades but did not get a chance to receive higher education due to poor economic status of the family. He used to earn some income from cereal production and by selling some milk in the market was utilized for the educating his son. Since his youngest son has autism, he admitted his son in Indreswori Secondary School (School for children with disability) at Melamchi but as he could not see any progress in his son and as per the suggestion from teachers, he took him out from school. Having two members with intellectual impairment at home, he had to spend most of his time taking care of his wife and children. The situation of his family got worse more than before as he lost his house and also shelter for his livestock after the earthquake of 2015. He says, “Economic condition of my family became worse after the earthquake. I have used my savings for building small temporary house and somehow managed a shelter for the livestock.” Though he has small plot of land, he wanted to engage in commercial vegetable farming to improve the economic status of his family. After a year of earthquake, SAPPROS Nepal launched Disability Inclusive Livelihood Project funded by CBM in his village. He was given support for commercial vegetable production through poly house construction and also seeds for open field vegetable production after having discussion about his problem in SHG. He got knowledge on vermicomposting and other technology related to agriculture.He says, “I am very much satisfied with the technology given by SAPPROS. He has also some savings in SHG and at times he takes loan from SHG for purchasing agriculture inputs and other necessities for carrying farming activities. Before the start of vegetable farming he cultivated only cereal crops, which not even enough for meeting family consumption. Now, He has been growing various seasonal vegetables and tomato in the poly house. 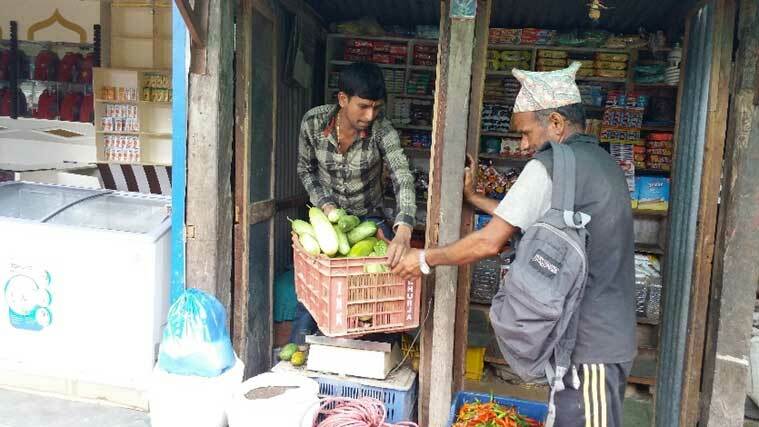 Dahal says, “I used to earn Rs.30000 from maize and paddy cultivation annually but now I earned Rs.1,45,000 by selling vegetables in Nawalpur bajar within 3 seasons and I am happy with the earnings.” He is using his earnings for meeting household expenses. He is planning to build a house for his family after earning enough money from commercial vegetable cultivation. Vegetable cultivation has helped him to increase his income as compared to cereal crop cultivation which helped him to sustain his livelihood. Devaki Bhattarai, aged 26, a resident of Indrawati Rural Municipality-10 of Sindhupalchok District is living with 6 family members. She is one of the examples of hardworking and self-sufficient farmer who proved that hard work pays off in our own country too rather than struggling in foreign land. 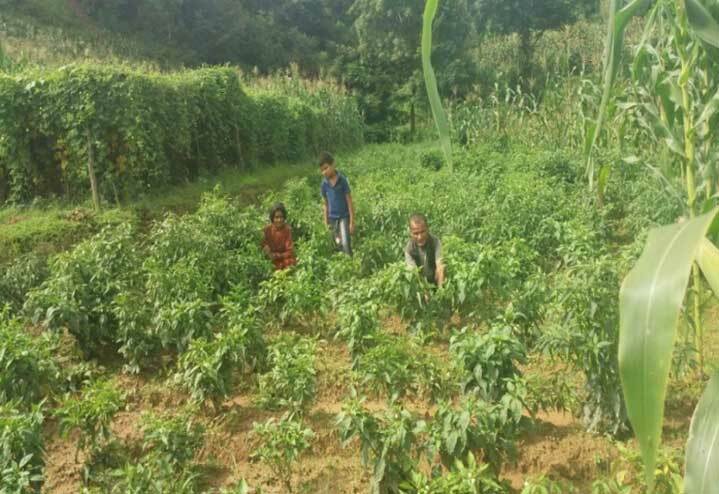 Bhattarai wasn’t involved in any sort of commercial vegetable farming earlier but grew vegetable only for home consumption. She was looking for the occupation to sustain her family. In that same period, she was given a job by a cooperative with the monthly salary of Rs. 2000 but it wasn’t enough to run her family. The production was hardly enough to feed her family two times a day. In addition, she also reared few cows, buffaloes and goat as it didn’t give enough income to survive so, she was frustrated. She hardly had enough money to buy educational materials for her children’s schooling. Even though her husband had gone for foreign employment, he didn’t earn enough income and he returned back. She was in a major dilemma as she had large number of children to feed. When the earthquake of 2015 caused major destruction in Sindhupalchok district, many organizations arrived with the relief materials and various programs. SAPPROS Nepal too implemented the livelihood project with major focus on the agriculture. Devaki also lost her house and livestock due to earthquake. So, she got involved in the Achheshwor Krisak Samuha formed by SAPPROS Nepal and became the treasurer in the same. 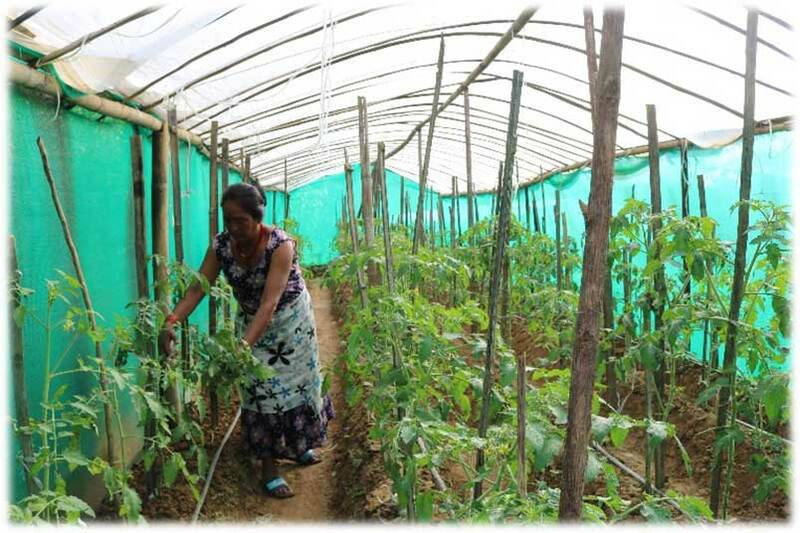 Devaki was selected for the integrated nursery program through the decision made by SHG members.SAPPROS Nepal built two plastic tunnels. She used one tunnel for growing seedlings and another for planting tomatoes. 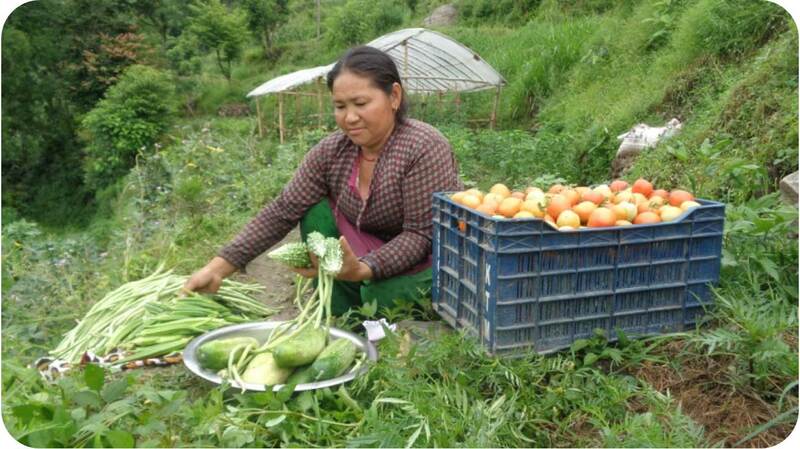 Within 30-35 days she was able to earn more from vegetable seedlings than from the job. It further encouraged her. 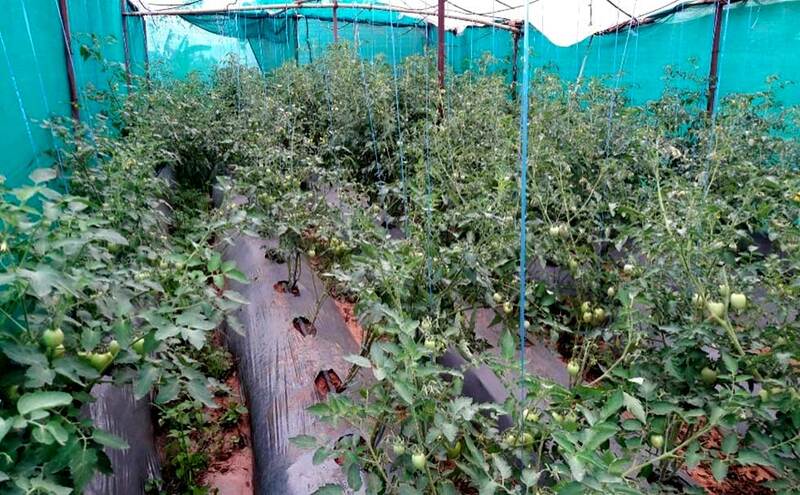 The tomato started growing and she was able to produce 600 kgs from one tunnel. The selling rate went up and down but she never lost hope. She even planted the seasonal vegetables like cucurbit, cauliflower, chilly and other vegetables. 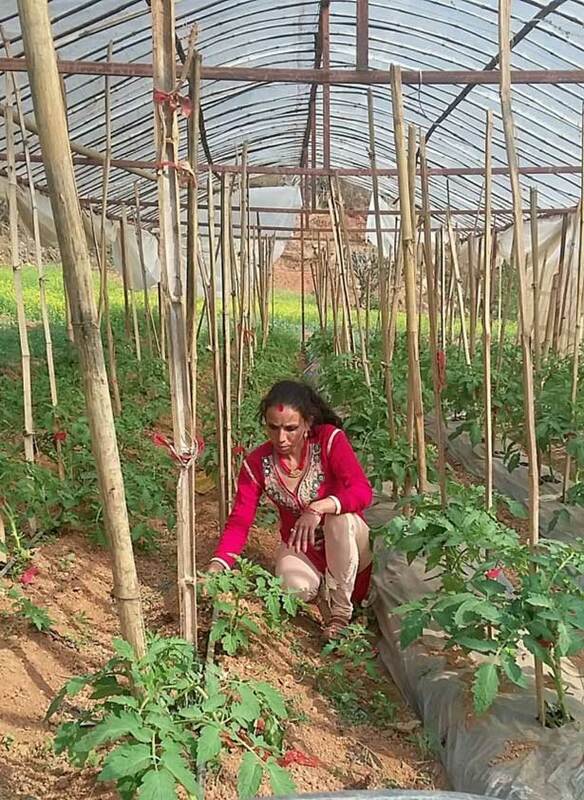 “I have earned NPR 126000 so far from vegetable plantation and integrated nursery within a year.” Bhattarai hopes to continue and expand her business and looks forward to make vegetable farming as a major occupation. She plans to register nursery in the Rural Municipal Office. Bishnu BK, aged 54 is a resident of Kispang Rural Municipality -1 Bhalche of Nuwakot district. Though he is an old man, but he is full of energy and vigor as he struggles with knife and block of wood chopping meat since dawn to dusk. He is one of the leading beneficiaries of the CBM funded livelihood project. Bishnu has altogether eight members in his family and he is the single bread-winner for all of them. His father is a person with physical disability as he lost his one leg in an accident. He has his younger daughter diagnosed with psychosocial disability by birth. Agriculture and labor work used to be main source of income, which was insufficient to feed his family. Both brothers work as daily labourers. The family has a small piece of land because of low productivity it could not give enough income to sustain them. He also went to gulf countries for employment, but he returned home empty-handed as he was not able to earn there too. The devastating earthquake of 2015 also added misery in their life as they were left with nothing. They were homeless, their possessions like clothes, utensils, store grains damaged and livestock killed. As Bishnu belongs to the group of Dalit minority community who are considered as untouchables in rural context of Nepal, his journey is inspiring. The villagers do not have any issue consuming meat chopped by him. “I never get bitter, and keep my spirits high,” says Bishnu, while talking about his life and often breaks into smile with the evening sun illuminating his face. Today, he is in celebratory mood and there are many reasons for this. 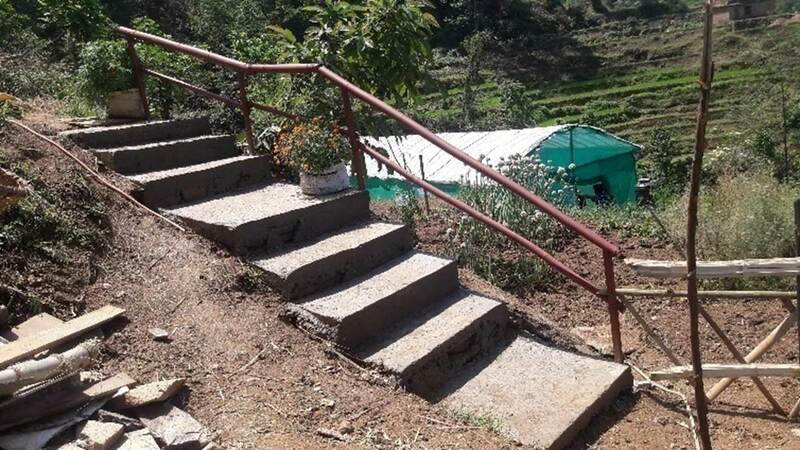 The disability inclusive livelihood project implemented by SAPPROS Nepal in partnership with CBM provided him with financial support to construct shed for meat shop and necessary materials. The total cost incurred was NPR. 64000. Out of NPR 64000, NPR. 24,000 was loan and remaining NPR. 40,000 was provided as grant. SAPPROS strengthened his capacity by providing business planning, saving and credit training and orientation on livelihood activities which can be carried out by a person with disability. The the support enabled Bishnu to become capable of operating his meat shop efficiently. Confidently he says, “Nowadays I earned Rs. 24000 per month. On an average a net profit of NPR 800/ per day.” He adds, “I have almost lost hope to maintain my family including two persons with disability but SAPPROS and CBM rebuilt my dream providing this support. Now my family can survive and I can afford expenses for the education of my children and other necessary expenses of the household”. The sensitivity of the community members has increased after the project. The success of people such as Bishnu has made the rest of the community members aware of the capabilities of disadvantaged and disabled people, and this has led to increase in respect for such people. Lamshal was one of the victims of earthquake, 2015 who lost her house as well as livestock property .She recalls, “I was completely broken when earthquake hit my house and my livestock. 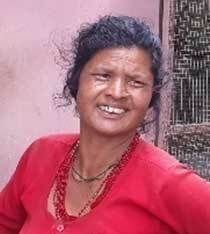 I feel like I have no option for my living.”After the earthquake, she was taken to rehabilitation centre at Chautara by her brother. After a year, she again came back home as she could feel comfortable to stay there.She was living empty handed as earthquake destroyed her home and livestockso started staying with her brother. Even her brother felt burdensome to take responsibility of her, so many time clashes occurred with her brother. She says, “Each time, I had to depend on my brother’s income which made her cry.” She does not want to be a burden to anyone being a visually impaired person. Staff of the project met her and gave orientation about the project. She joined SH Group and became chairperson of Setidevi Krisak Samuha. She was supported with goat shed and seed money of NPR. 20000 for purchasing 4 goats. She has altogether 5 goats including one boar breed of goat supported by CAFOD & Trocaire. Her confidence boosted up when she was given opportunity to participate in Commercial Goat farming training. Today, she does not depend on his brother for survival. She is now living separately from her brother. She can manage her household expenses and medicine by herself. She is living her life smoothly and independently caring her livestock related activities. “Thank you SAPPROS Nepal for giving me a new hope for living and making me feel independent,” concludes Lamshal. Man Ghale aged 54 is a resident of Kispang Rural Municipality ward-1 (previous Bhalche-4, Kolgaun) located approximately 30 kms north-west of Battar- along the Trishuli highway. He has altogether five family members and blessed with three children; two daughters and one son. His son went to Malaysia for foreign employment but till date he has not sent any single penny. At the age of 40, he got paralyzed and unfortunately his impaired leg and physical disability made him feel more hopeless. The situation was tough as he could not assist his family for day to day living. The land he owned was very dry and barren. So, only cereal crops like wheat, maize, millet and barley were grown but the production was insufficient to meet family needs. Due to food insufficiency his family had to depend on daily wages by working on neighbors’ field for their daily subsistence. The sorrowfulness of his family did not end as his family became victim of Nepal earthquake, 2015. Within a blink of eye, his shelter turned into rubbles and he lost his cattle. Since then, he was living in miserable condition in temporary shelter. Struggling economically, socially and physically each day, he found rays of hope when a project team from SAPPROS Nepal met him during the inception meeting in the month of March, 2017 for implementing “Disability Inclusive Livelihood Project” funded by CBM. He became member of inclusive self-help group named Kolgaun Farmer’s Group in his settlement formed by SAPPROS Nepal. 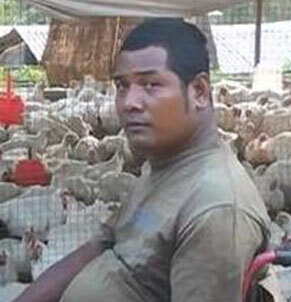 Based on the decision from self-help group and since he met the targeting criteria for project support, he was provided with combined poultry and goat shed. He also got poly house and drip irrigation set for vegetable farming. 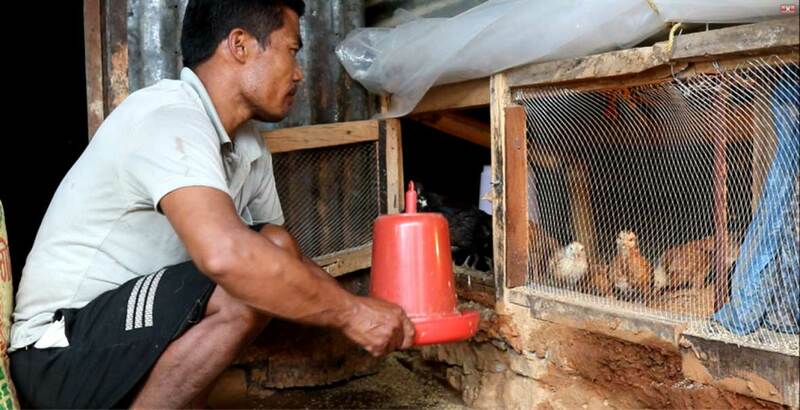 Furthermore, to enhance his implementation capacity, the technical teams of SAPPROS Nepal provided him with poultry and goat farming training. SAPPROS Nepal not only encouraged him to do poultry farming but supported him with 100 local chickens (Giriraj Breed) with feed. He has been able to earn NPR. 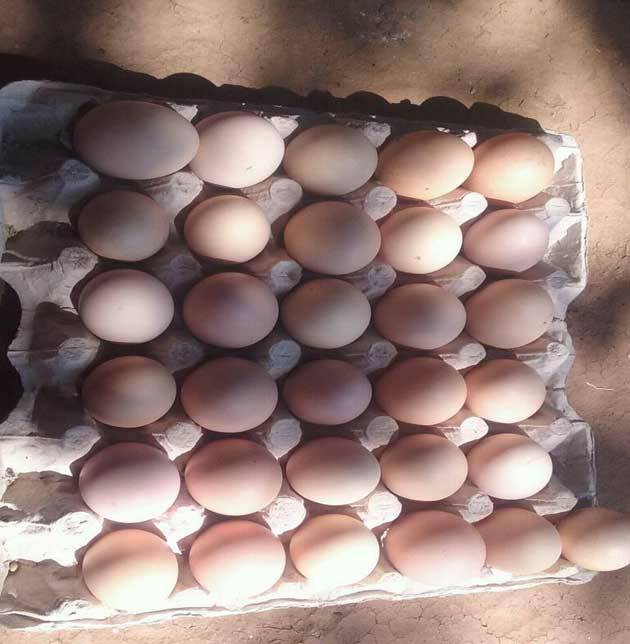 60,000 by selling eggs and chickens from first lot and has added 100 chicks in his farm from the profit made from the first lot. He is planning to sell his goats during October, 2018 in Dashain festival enable to fetch higher price. Man Ghale aims to use earnings for regular household expenses and also for the construction of permanent house. He whispers, “I have never thought to do this business but with the financial and technical support from SAPPROS/CBM and the tireless contribution of my family members, we have been able to live a dignified life today.” His wife Mrs. MaikuTamang expresses, “With the support of crutch, my husband is able to provide feed, water, medicine and taking care of farm properly. We are very much satisfied with the support given and the income earned”. 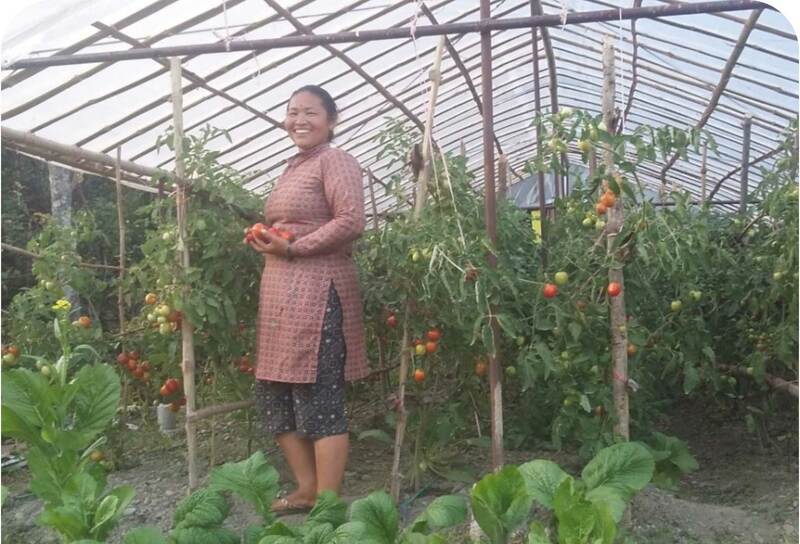 Man Ghale says, “The change was not limited within the improvement in my livelihood but also project has built in social harmony in the local community.” He is expecting further increase in income from his vegetable grown in the polyhouse. The project has changed the social paradigm of the village by including the most vulnerable groups including person with disability. The knowledge, skills were transferred to unreached people through this project and these people have become role model in the community. Purna Bahadur Danuwar, aged 41, is a resident of Indrawati 12, Bhimtar of Sindhupalchowk district. Altogether there are 5 family members which includes 2 sons and a daughter. His elder son and daughter have passed Grade 12 and youngest son is studying in Grade 10 while he has studied upto grade 5. He has 0.8 ha land where he mainly used to grow cereal crops and pulses like maize, wheat, rice, blackgram etc. He has been doing subsistence agriculture since ages and he used to run a small shop which was one of the main income sources of his family which hardly met his expenses. The destruction caused by the earthquake of 2015 further deteriorated their livelihood status. 3 houses were completely destroyed including shed, the milking buffaloes died, two pregnant improved goats were killed and 12 ducks were killed. In addition the goods kept for sales buried and destroyed when the shop collapsed. As the saving credit record of shop of over one hundred thousand was destroyed due to earthquake, it could not be collected. He almost lost his hope when he saw everything messed up. After a year, he managed to stay in the temporary shelter. SAPPROS Nepal in partnership with CAFOD & Trocaire entered in Sinhupalchowk at the same time through livelihood project. A SHG called Nageswori SHG was formed and he became a member of SHG. SAPPROS studied his situation and helped him to build improved cattle shed. He says, “I have bought a milking buffalo by taking loan of Rs. 85 thousand from a micro-finance institution. I sell 6-7 liters milk daily and have been earning NPR. 10,000 monthly.” He was also supported with seasonal vegetable seeds for open field crop farming. 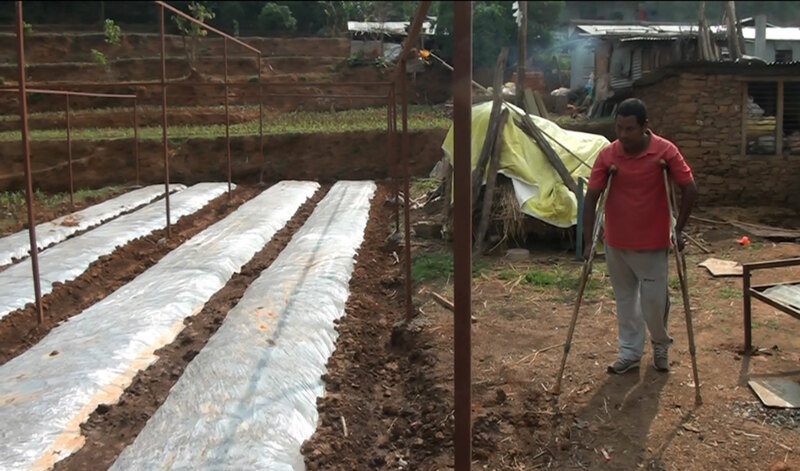 Also, he has made poly house for vegetable cultivation by himself. He earned NPR 150,000 by selling vegetables. Sanokanchhi Tamang aged 46 is a woman with physical disability. She lives in Dupcheswar Rural Municipality -2, Gaunkharka of Nuwakot district. The 2015 earthquake entirely changed her life as she was hit on her entire body which made her survive with physical disability for the rest of her life. She received major injuries on her feet and backbone. Prior to earthquake she used to work in her small plot of land but production was in adequate to fill the appetite of seven family members. Similarly, she supplemented her family income through engagement in seasonal labor but after earthquake she was not able to do so. Tamang faced pitiful days when she became physically disabled. The community of her village were not conscious about the difficulties of persons with disability. Tamang was totally neglected by the communities and even by her family members due to the negative perception that persons with disability are the burden of the society. Remembering those terrible days, she says, “Since I am a person with disability, people used to hesitate to speak with me. I felt hurt by behavior of the people. 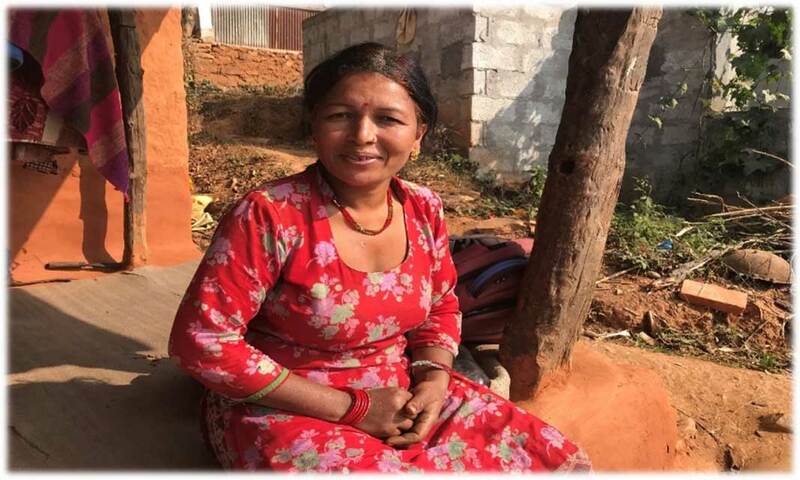 As days passed by, after a year of earthquake when SAPPROS Nepal reached in her small hut, her life took a turn. She joined Pemeshwori Self-Help Group under inclusive livelihood supported project in partnership with CBM. Sanokanchhi got support for starting poultry farming. She was provided with 200 chicks, necessary equipment anddeep liter system poultry shed at a total cost of NPR 55,950 as seed money. SAPPROS provided saving and credit training and orientation on livelihood activities which can be carried out by the persons with disability. At first it was difficult to enlist her in self-help group and convince her for livelihood activities. But, with frequent meetings with SHGs, she herself showed interest in poultry farming. She is running a poultry farm and she has earned NPR. 145,000 within one and half years. Her younger son supported her in the business. There are not any other people with disabilities in her settlement who are engaged in such farming activity. With this, she has been able to create her own identity as a leading farmer and a source of inspiration for rest of the people with disabilities. She is planning to continue to do her business for betterment of her livelihood. 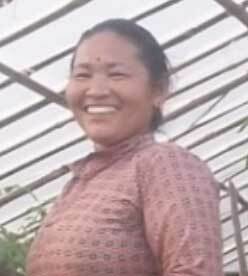 She has generated high income expenses related to children’s education, household expenses and saving some money for her old age too.“My children are supporting me to run my business and now I have full hope that I can survive easily in days to come,” says Tamang with wonderful smile on her face. Sukra Bahadur Tamang, 30, lives in Gaurighar, Tinpute-7 in Sidhupalchowk district with his three-year-old daughter and wife. At the tender age of two, Tamang lost his four toes when he fell down from the field which affected his ability to stand and walk independently. His parents took him for checkup but all in vain nothing happened. The geographical boundaries and fragile economic conditions brought a lot of misery in Tamang’s life after the injury. He lives in the Sindhupalchowk district which is one of the most affected districts of 25th April 2015 earthquake. People still live in makeshift tin sacks that they call home and gradually are moving towards recovery. But, the scars still remain. Recalling back those dreadful days, Tamang says, “It took only15 minutes for a person without disability to reach the school but for me it took more than two hours of difficult walk. My sister took me to school until I was in fourth grade,” Unable to buy crutches, he then started crowling with his hands and feet. “It was the toughest journey of my life,” Tamang adds. 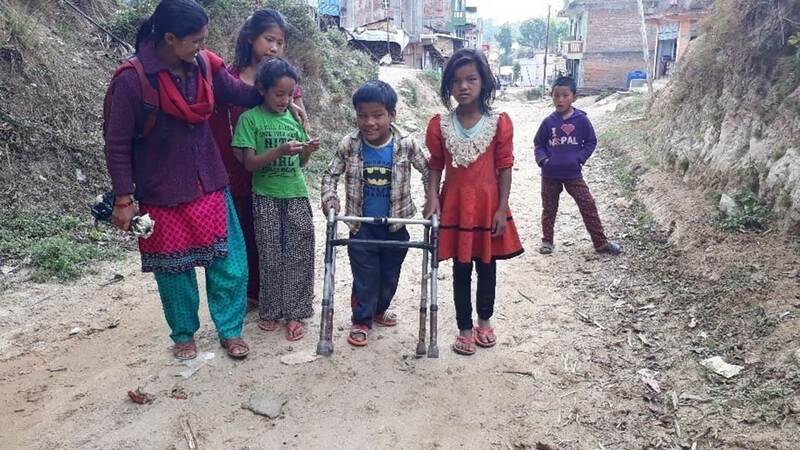 After years of struggle, his happiness knew no bounds when Tamang’s father brought a pair of crutches. His mobility improved and he decided to continue his studies. However, Tamang failed in his tenth standard and decided to leave the school. After few years, Tamang lost his parents. Misery added when his house was completely destroyed by the earthquake. The family had pooled their earnings to build a two-story house. But, their house was damaged when the quake hit and they were became homeless. The life of Tamang has changed now. He is a part of CBM’s disability inclusive livelihood project which is under implementation with the support of an INGO called CBM. SAPPROS is the implementing partner of the project. 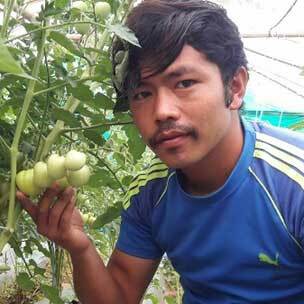 A week-long training on integrated nursery and a poly house in the village has helped Tamang to upgrade his capacity to enhance his livelihood. 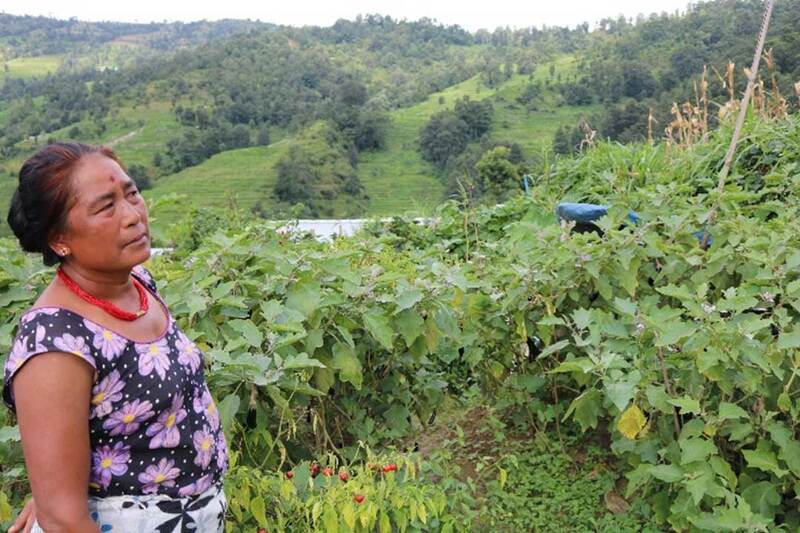 Tamang now grows thousands of saplings and produces vegetables. “I sell saplings and vegetables within my community and local shops and earn Rs. 150,000 annually.” he tells. He adds that the road that leads to his house has been made accessible by removing the barriers and making him easier to walk. He now leads ‘Paurakhi Krishak Samuha’ a self-help group which comprises of eleven members and helps the local people in carrying out organic farming and other livelihood related activities. Also, the members are saving money in SHGs and the money is used for lending for income generating activities. Sukra also takes loan from SHG for purchasing seeds and other necessary materials for vegetable cultivation. Moreover, Sukara has expanded his business by starting poultry. He says, “I have earned Rs.210,000 from local poultry production within 7 months and I am quite satisfied with this work too.” Both the poultry farming, nursery and vegetables production is helping him to earn throughout the year even in lean season as one compliment the other business. 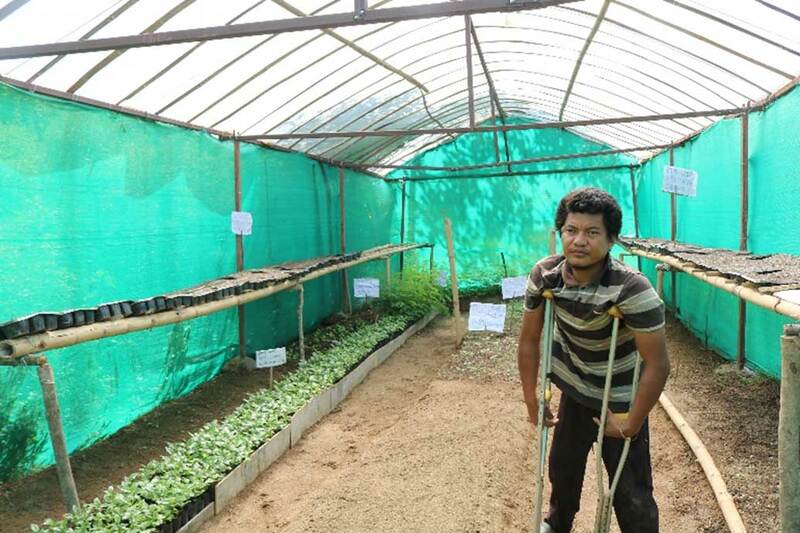 Tamang is the first person with disability in his community who is challenging the mindset of people that if given an opportunity one can set an example. He now wants to continue the job and says being able to eke out his daily life and economic empowerment has been the biggest change in his life. “I have used my own land to grow vegetables and this makes me happy,” he adds. 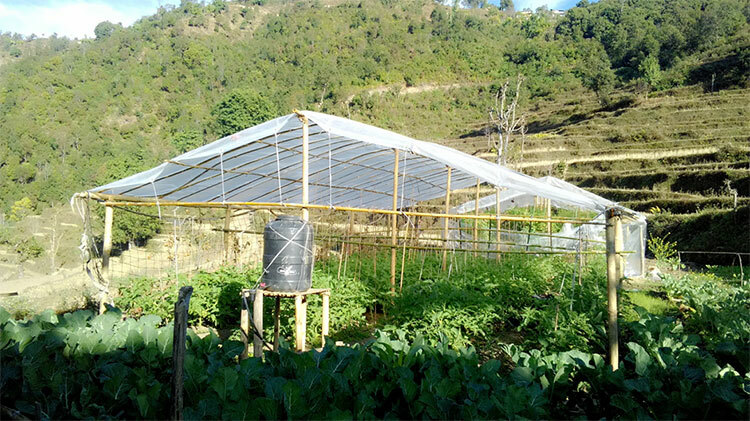 Since he started the nursery, vegetable cultivation, poly house and poultry farming, Tamang has been a source of inspiration for all the villagers as he has educated his child and rebuilds his house. “Thanks to SAPPROS Nepal and CBM. I now live a dignified life and feel respected. The negative attitude towards persons with disabilities has been changed,” he adds. CBM works with SAPPROS Nepal by providing livelihood opportunities and believes that access to livelihood support is fundamental in ending the cycle of poverty. 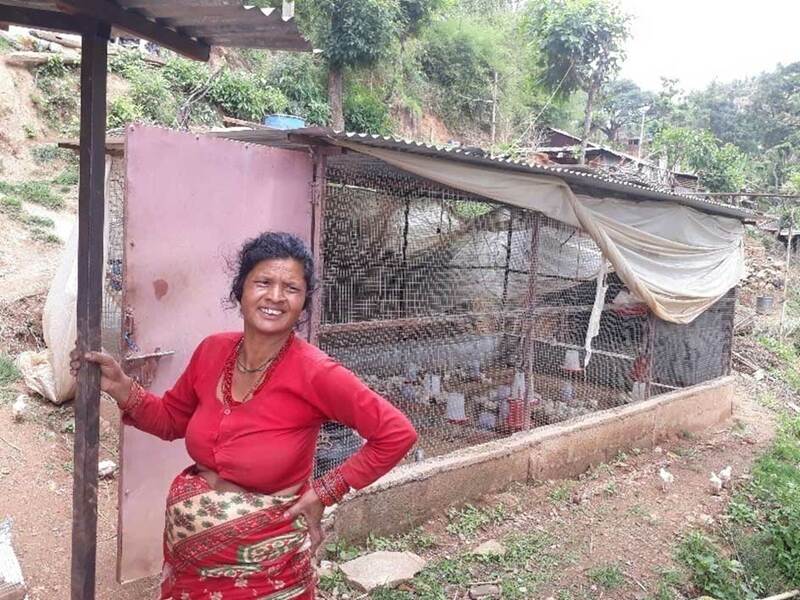 50 years old Sanu Roka is the resident of Duginchaur of Sipapokhare, Sindhupalchok district is supporting her family through local poultry farming. She has 6 members in the family. She has 3 sons and 2 daughters. One of her daughters is a girl with psychosocial disability. His elder son had left them and had started living with his wife. Both the husband and wife were laborers. They toiled hard from the dawn to dusk, ignoring the scorching sunlight and landlord’s deriding words just torture her family. She says, “I earned NPR 300 per day by working in landlord’s land which would hardly meet her family’s needs.” Adding to their despair, the earthquake of 2015 destroyed their property. Their animals were killed and the house was destroyed. They became very poor. In the post-earthquake scenario SAPPROS Nepal in partnership with CBM was one of the organizations which implemented the livelihood program in Indrawati municipality. For the implementation of the program Self Help groups were formed in the target communities. Rokka became member of Janajagaran Krisak Samuha which was SHG. Rokka says, “Our group members were oriented regarding the objectives and activities of the program and the group discussed and decided about the type of income generating activities to be carried out by each member of the group. Though most of the 27 members of the SHG have been generating good income from the various livelihood activities, the major changes can be seen in the life of Sanu Roka who was engaged in poultry farming. She was given support for building poultry shed having a capacity to accommodate 200 birds. In addition Rs 22,252 was provided from the revolving fund for the purchase of chicken and feed. In addition she was given an opportunity to attend commercial poultry farming training. Within 5 months duration, she earned NPR. 39,050 by rearing local chicken in the land and kept another lot of broiler chicken in the shed. 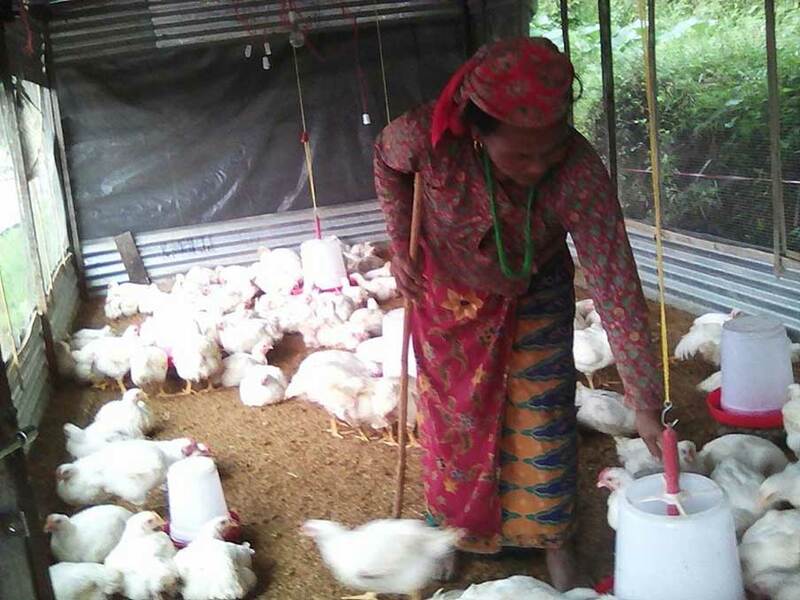 She adds, “The income generated from the poultry farming has not only improved my investment but it also helps to meet the household expenses. I have been relieved from the stress of working for others as labourer which makes me really happy.” Furthermore, Rokka is able to take care of her daughter than before as she now spends much of her time in poultry shed nearby her home. 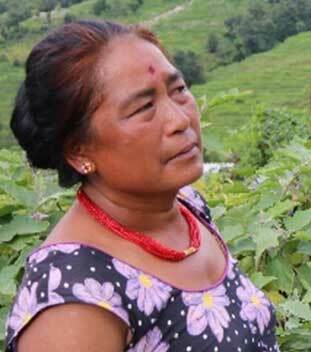 Sanukanchi Rana Magar aged 50 is a confident lady lives in Indrawati Rural Municipality-4, Sindhupalchok district. She lives with her husband, two sons, one daughter, two daughters-in-law and three grand-children. Like others, she is also a farmer. She along with her husband work till dawn to dusk to meet the needs of the family. Uneducated Sanukanchi only knows how to sign her name but she has enrolled her granddaughters in school though it was hard to pay fees. She used to somehow manage it. She used to do farming but notcommercially and was not earning enough income out of it. However, she reared poultry which was the main source of her income. Her family joined hands in her work. Despite involvement of entire family members in the economic activities, it was always difficult to meet essentials of a large family like hers. Life was moving along, one way or another, the despair added when earthquake shook her house during April, 2015.The earthquake took away her father-in-law’s life, two houses, two buffaloes and the poultry. Their economic situation became miserable. 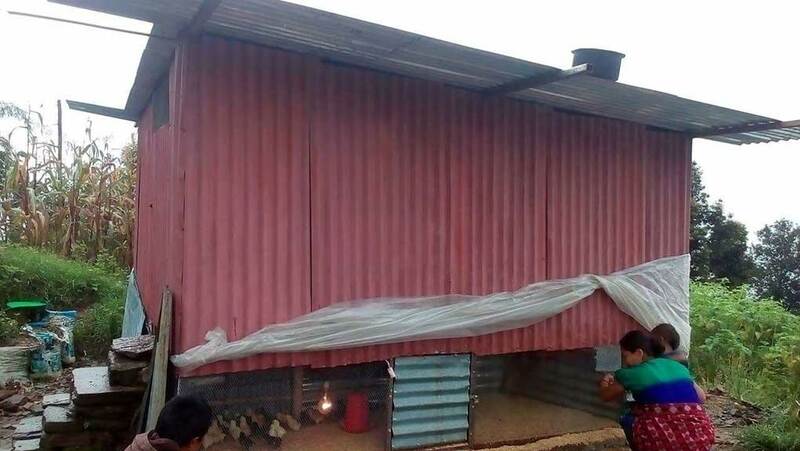 To cope up with the situation her family had constructed a temporary shed in a fellow villager’s land and lived there for a year and settled back again in their own land in a temporary shelter. Sanu Kanchi is rearing chickens in her poultry shed and has been growing different types of seasonal and off seasonal vegetables in her farm. “I have earned NPR. 120,000 from vegetable cultivation in two season and hope to earn more in next season.” She had recently sold 600 chickens and earned NPR. 50,000. “When I receive money from my hard work, I feel really happy.” She smiles. Today, Sanukanchi is able to improve the livelihood status by fulfilling necessities of the of his family with the income she earns. She adds, “I am paying loan in instalment and I have paid money to land owner of 1st year. She also has some money in SHG and remaining spent for my grandchildren’s education and to cover household expenses.” This is just the beginning, Sanukanchi aspires to continue farming in the future as she has been doing well until now and making a handsome profit from her business. She is planning to extend further her business after clearing the debt. She wishes to construct a new home for her family in near future. 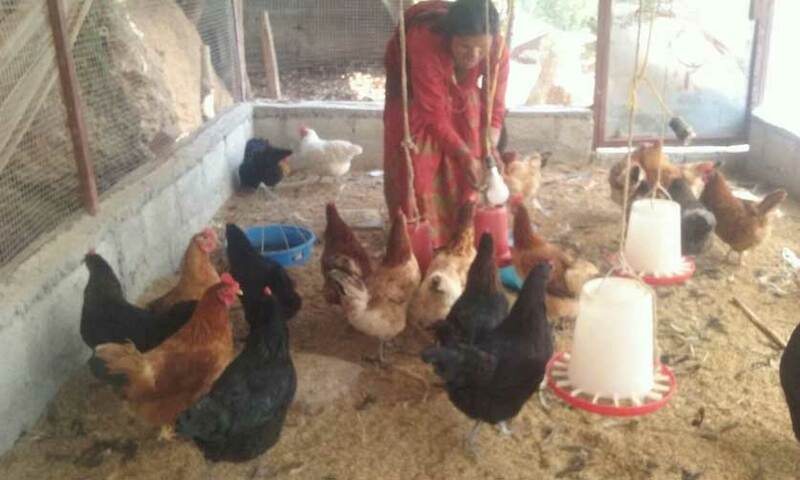 Thus, commercial vegetable cultivation and poultry farming proved to be good livelihood option for Sanu Kanchi and her family after earthquake. She expresses her happiness, “I am thankful to SAPPROS Nepal for supporting us during difficult time and making us capable to become happily again.”She dreams of her children to have good education and become successful person in days to come. 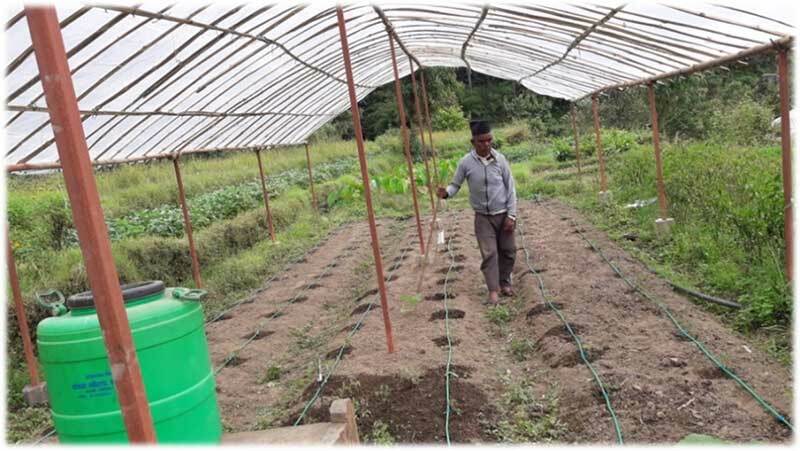 Bipin Danuwar, aged 22, residing in Indrawati Rural Municipality-12, Bhimtar has got rapid transformation in his livelihood through the adoption of commercial farming technology supported by SAPPROS Nepal in partnership with CAFOD & Trocaire. After devastating earthquake that took place in April, 2015 left him with empty hand with no shelter and food, SAPPROS Nepal helped him for livelihood improvement. Bipin has 7 members in his family. His parents are engaged in agriculture too. He did the household tasks and worked as a laborer. He has 2 ropanies of irrigated land and 2 ropanies of unirrigated land. The production from subsistence crop kept his family fed only for 9 months. He along with his brother used to work as laborer to meet the basic needs of their family year round. Due to poor economic status he wasn’t able to start any business but when SAPPROS Nepal entered his village with livelihood improvement package after the earthquake, he became member of Nageswori SHG. 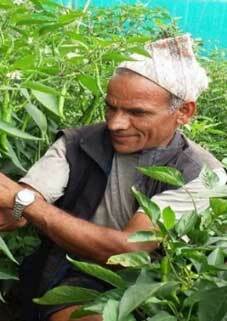 He was provided with seed support and he started vegetable farming in kitchen garden at first. Later after observing his performance he was given a plastic tunnel for vegetable cultivation. 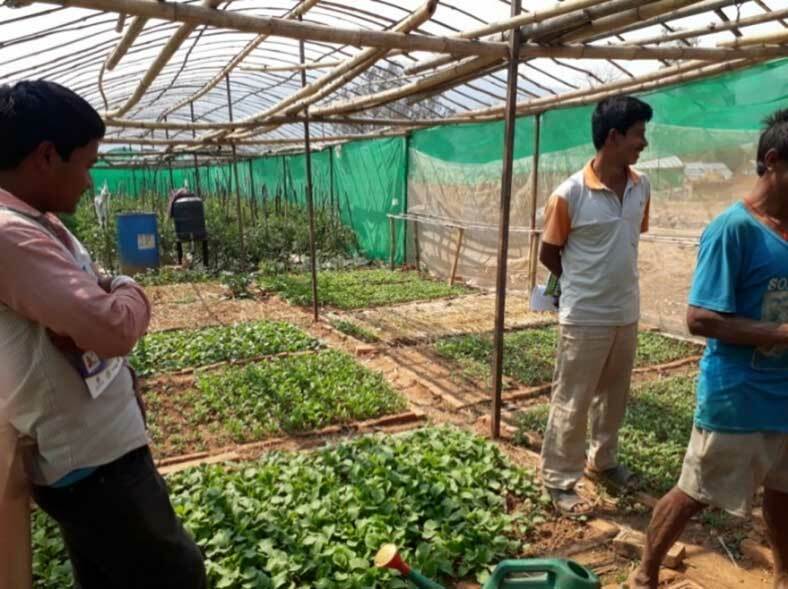 Training on high value vegetable farming, organic manure (jeevatu, waste decomposer, jholmol) preparation, using affordable technology like poly house, simple irrigation technology like drip irrigation, mulching etc. were provided to him to build his capacity. 26 years old Bishnumaya Bika has 5 members in her family. She is the inhabitant of Kalyan Pokhari, Indrawati Rural Municipality, Sindhupalchok district. She has 2 sons and a daughter. She belongs to “Dalit” family. Her daughter studies in Grade 10 and both of her sons live in Kathmandu. Her husband is a labourer. Her sons are learning statue carving. She has 3 ropanies of unirrigated land. The production is enough to feed her family for 3 months only. Rest of the year, her family had to depend on her husband’s income. Again, it was difficult because he earned hardly enough to meet every day basic needs of the family. Massive earthquake of 2015 shook not only the Nepal’s earth surface but also the lives of people. Kalyan Pokhari village of Sindhupalchok district is also one of the communities which were adversely affected by the earthquake. 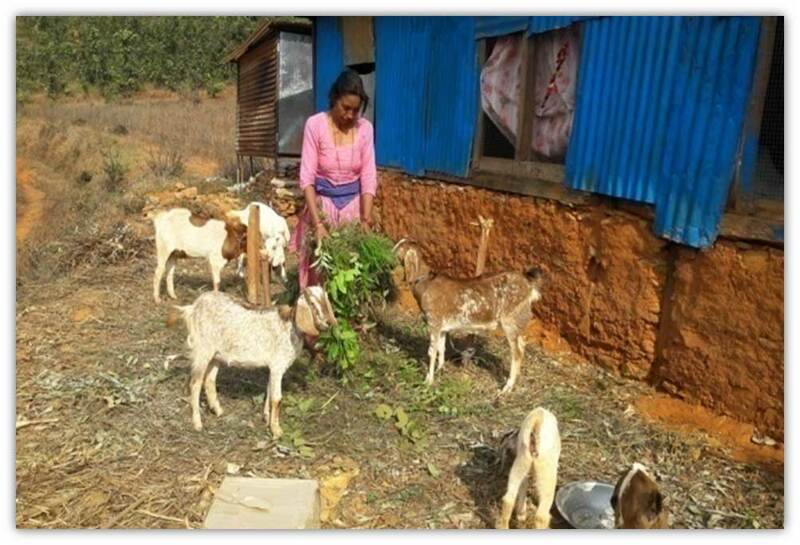 Bika lost her house along with 2 goats and other material possessions such as clothes, utensils, stored grains etc. They had to face a lot of trouble because of the loss incurred. Her family lived in the tent until the earthquake stopped. They still live in the makeshift house that they later built after the earthquake. 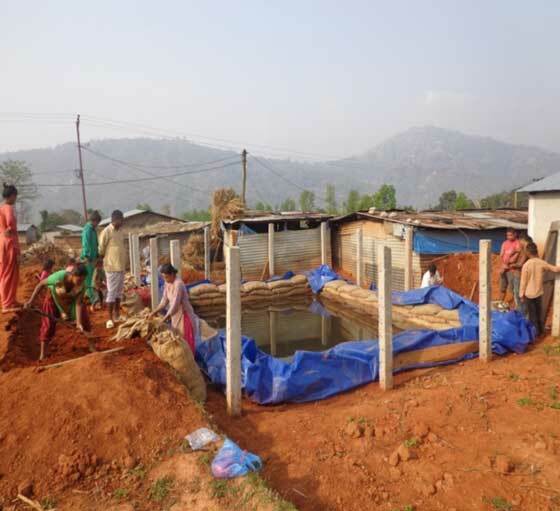 SAPPROS Nepal in partnership with CAFOD &Trocaire implemented “Livelihood and WASHIntegrated Recovery”project in Sindhupalchok district. Kalyan Pokhari Krisak Samuha was formed and she became the member of the SHG. She was supported for charcoal production as income generation activity. The availability of raw materials for making charcoal in her village had made easier for her to do this business. At present, Bika has been involved in making charcoal and selling it to the local vendor from “Green World.” She goes to the forest by walking for an hour along with some of her friends and collects different types of fallen tree branches and bushes used for charcoal making. Next day she makes charcoal by burning all the collected items in a drum. She sells it to the local charcoal vendor, the vendor then sales it in Kathmandu market. She says with joy, “I have earned NPR. 100,000 from charcoal production and I am continuing this business too.” She also gives some money to her friends helping her for collecting raw materials. With the income from the charcoal production she has bought a goat costing NPR. 10,000. “I have not only saved money in the SHG but also have been able to educate my daughters. SAPPROS Nepal has changed my life,” says Bika with full of confidence. 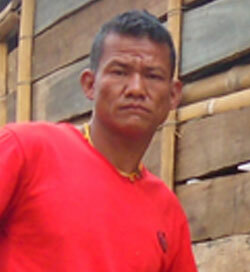 ManKaji Tamang is 40 years old resident of Dadagaun -6, Indrawati municipality of Sindhupalchowk district. There are seven members in his family. He has 5 children (2 sons and 3 daughters). His son is a person with physically disability since childhood wherein the earthquake of April, 2015 made his mother physically disabled when earthquake struck his house. He was one of the earthquake affected persons of the district who lost his wife and father during the devastating earthquake. His mother and he was buried inside the collapsed house and was rescued by the rescue team. However, they failed to rescue his father and wife. At the same time, he also lost his livestock shed along with all the animals. Currently, he is living in small temporary house made up of tin in extremely miserable condition. His son had a misfortune during surgery. At first, lump was seen in the back part of his body. Then after, he was taken to Teaching Hospital, Kathmandu for treatment and surgery was done in order to cut that lump. During surgery, unfortunately a nerve was also affected at the back bone which resulted in impairment in both legs. Since then his son cannot walk though he tried hard to cure him. After devastating earthquake, they were weak and vulnerable due to great human and economic loss. In the meantime, he was supported by other INGOs with NRs. 10,000 for purchasing 2 goats only. He has altogether 14 goats but he did not have livestock shed to keep them. 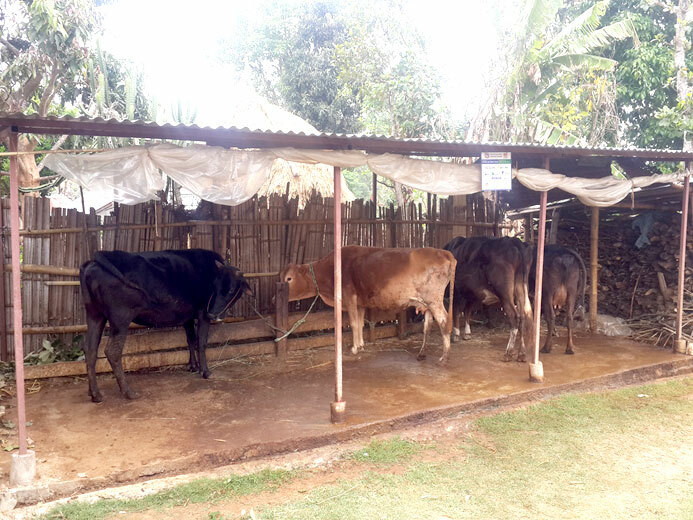 Tamang says, “There was danger of livestock being killed by wild animals, when they were left in the open.” So, there was urgent need of livestock shed for him to provide safe and suitable shelter for the livestock. Realizing this needs, he got support for a combined shed of goat and poultry through “Livelihood Support for earthquake Affected Population” project which was implemented by SAPPROS Nepal in partnership with CBM. He also got financing support amounting to Rs 8000 for buying 30 local chicks (Giriraj) and other necessary feed and equipments for poultry rearing. In addition, financial support for the purchase of seasonal vegetable seed was provided for vegetable cultivation. The opportunity to participate in 3 days “Commercial Poultry Farming” training organized by SAPPROS Nepal enhanced his capacity to manage the enterprise. 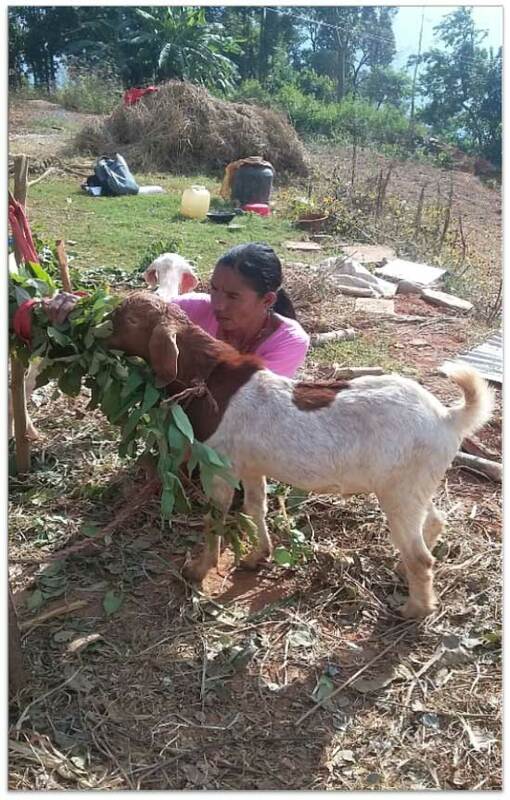 Today, Tamang is happily rearing goat, chickens and producing vegetables in his field. He says, “I have earned NRs 30,300 from the local poultry, NRs. from 54,000 by selling goats and NRs. 150,000 from vegetable production resulting in combined income of Rs 234,300.” Also, urine and goat dung, chicken litters collected through improved shed management has helped him to minimize then use of chemical fertilizer to a large extent. He adds, “I don’t need to go to market for selling chickens because people come to my house for buying. I have no problem for selling vegetables as local market is nearby my home.” He has his saving account in Naulimahadev saving and credit cooperatives and his deposited amount comes to NRs. 10,000 till date. Also, Mankaji is making monthly savings regularly in SH Groups. Kanchhi Tamang aged 41 lives in Kispang Rural Municipality-2 (Fikuri Village of Nuwakot district. She has eight members in her family including her parents, husband and four children. Her husband went to Qatar to seek better employment opportunity abroad. 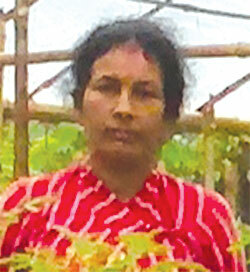 She was somehow sustaining her livelihood through agricultural operation. The earthquake and their aftershocks occurred during the year 2015 were devastating and extremely disturbing for Kanchhi and her family. The family was brought to the roads, their home destroyed and their source of income a piece of agricultural land was also ruined. She was in dilemma as what to eat and how to survive. She remembers those days, “There was not any certainty of our death or survival. Days were pitiful when there were aftershocks with no food and shelter.” She doesn’t want to recall those tough days. After couple of weeks, she constructed a temporary shelter where her family were living there since last two years. During December 2016, SAPPROS Nepal working in partnership with CBM implemented “Disability Inclusive Livelihood Project” in Kanchhi’s VDC. An inclusive Self-Help Group (SHG) named Ambote Krisak Samuha was formed with 17 members including Kanchhi Maya and 4 persons with disability. During discussions, Kanchhi discovered the range of activities that she could pursue. She decided to pursue commercial vegetable and livestock farming. 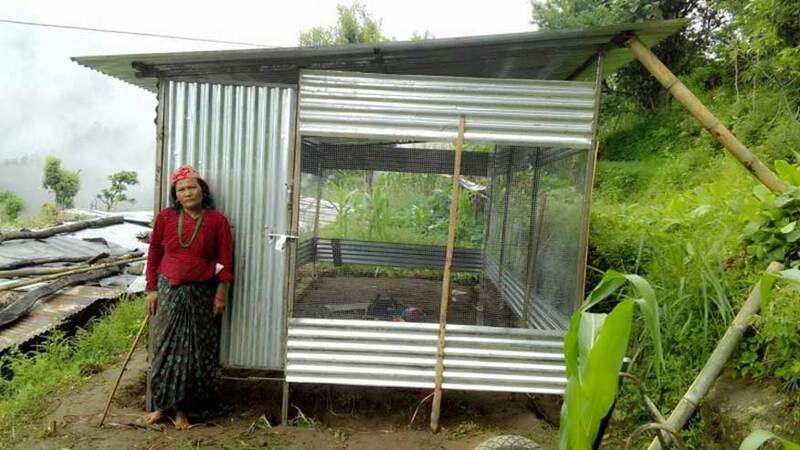 She requested assistance to do so and she was provided with plastic house and improved combined cattle and goat shed. 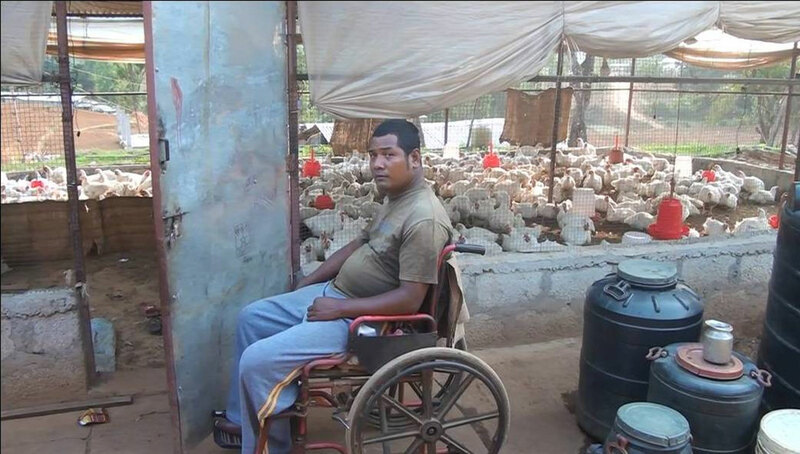 Hari Danuwar (42yrs) aspires to rise as a new entrepreneur in the poultry farming business after his well settled business was shut down when he met an accident in his rice mill. 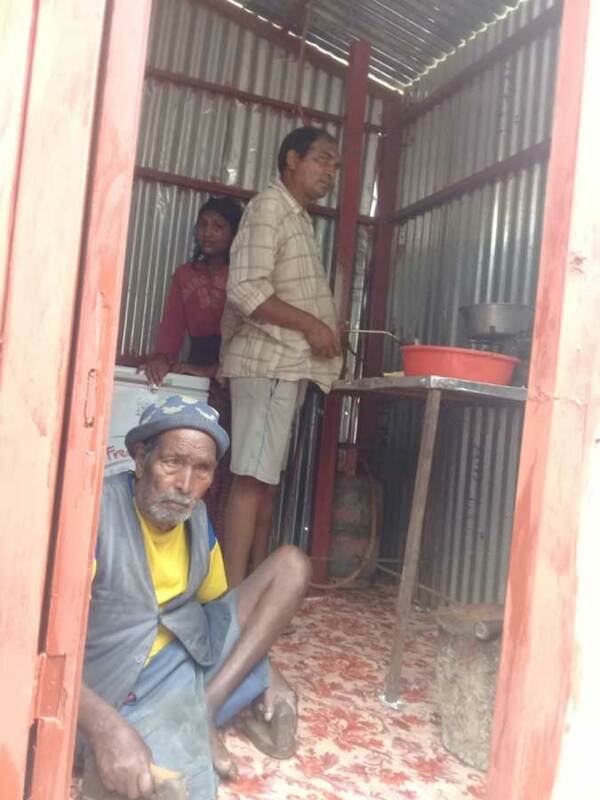 Mr Danuwar is person with physical disability and is the only bread earner of the 5-member family that he lived together at Peepaltar village of Indrawati Municipality of Sindhupalchowk district. Till the year 2005, he was running a rice mill in his village and was earning a good income which was sufficient to meet the family’s needs. One fine day while working in his mill he was caught by electric shock which left all his limbs numb and was placed in wheel chair since then. And this situation was really hard for him and his family to cope with. The family situation was turning low day by day and the family was struggling with the daily life as a unit after the accident. The situation got worse when their only house was destroyed by the Earthquake. “We were homeless after the earthquake but not hopeless and somehow we managed a shelter in temporary hut“ Danuwar said confidently. Once they got involved in Inclusive livelihood project implemented by SAPPROS Nepal in partnership with CBM, their life took a turn. His wife became member of Aapkhola Self Help Group (SHG) and also started saving money in the SHG. After consultation with Hari and his family member in the SHG, he was supported with a poultry shed with the holding capacity of 500 chickens. 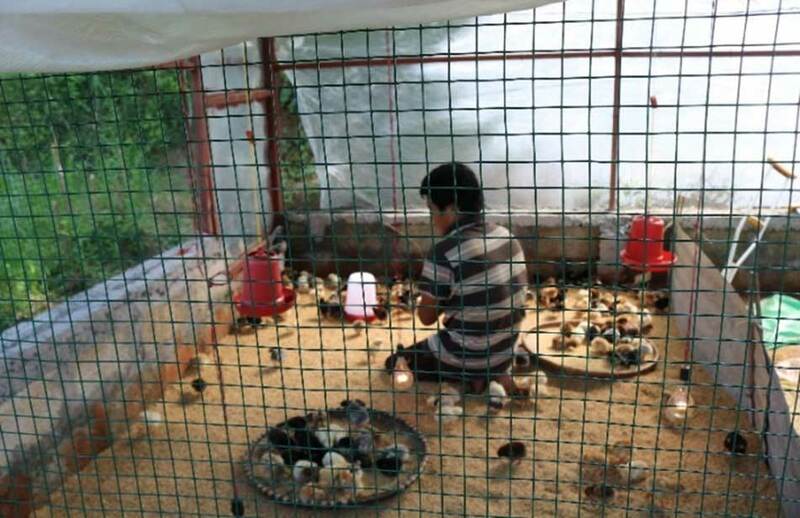 He took a loan from a local moneylender for the purchasing 500 chicks. The shed was made technically accessible to Danuwar as he could not move around the shed and take care of the chickens. 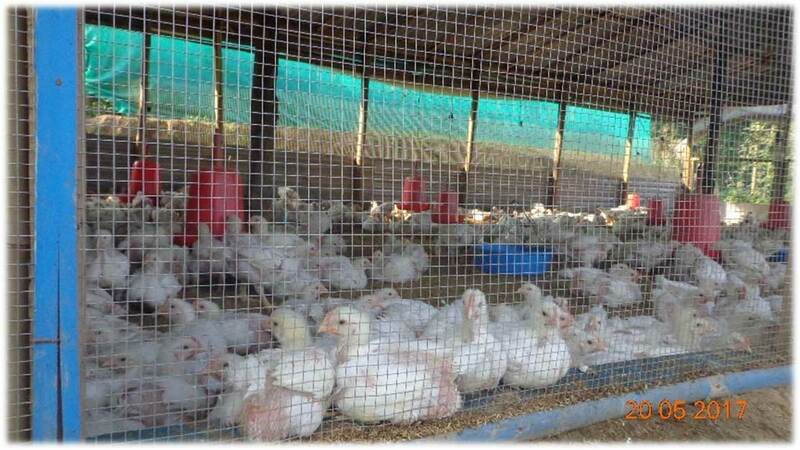 Also, his wife took “Commercial Poultry farming” training to assist him in this endeavor. 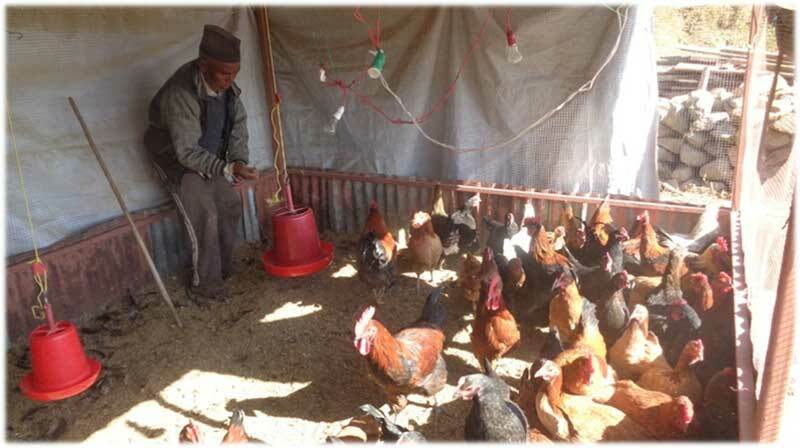 “Seeing their tireless effort and never quit attitude I am assured to provide them more loan as they need for fostering their poultry business” says the money lender who provided open the loan. Now their whole family is living a dignified life through the earnings from this poultry operation. He earned NRs. 1, 60,000 in fourth lot and is preparing for the fifth lot of broiler chicken. He has started saving some in local microfinance institution. He has also constructed plastic tunnel for tomato cultivation nearby his home which used to be barren. He says, “I am very happy to use my barren land for gaining extra income.” After the intervention he is more confident, he started engaging in simple works that he could do. His bodily movement has also improved on his own because of his engagement in farming activities. Now, he has started using crutch for his mobility where he finds it easy while earlier he used to be passive sitting in wheel chair only. Moreover, Danuwar has successfully regained his social and economic status which he was having earlier. 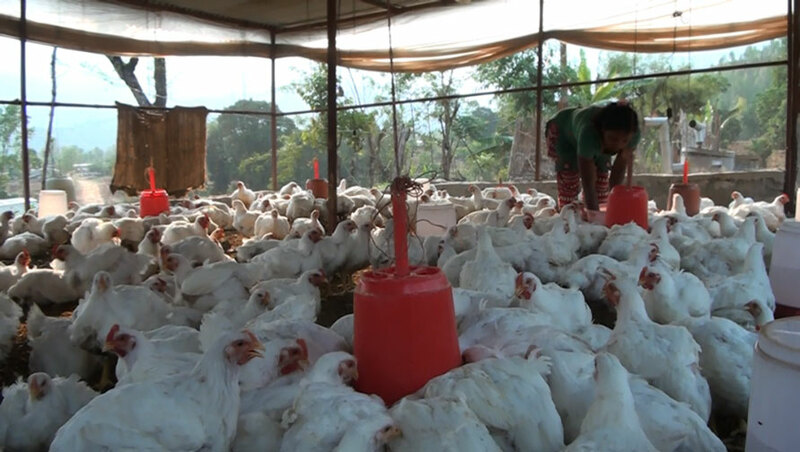 Danuwar couple plans to use his savings for upgrading their poultry business, expand vegetable cultivation and provide higher education of their children. He and his family is a shining example of “You never lose if you do not quit” to the whole village. Mrs Tikamaya Pandit, 41, represents a lower middle family in the community. She has a family of five, a husband and three kids. 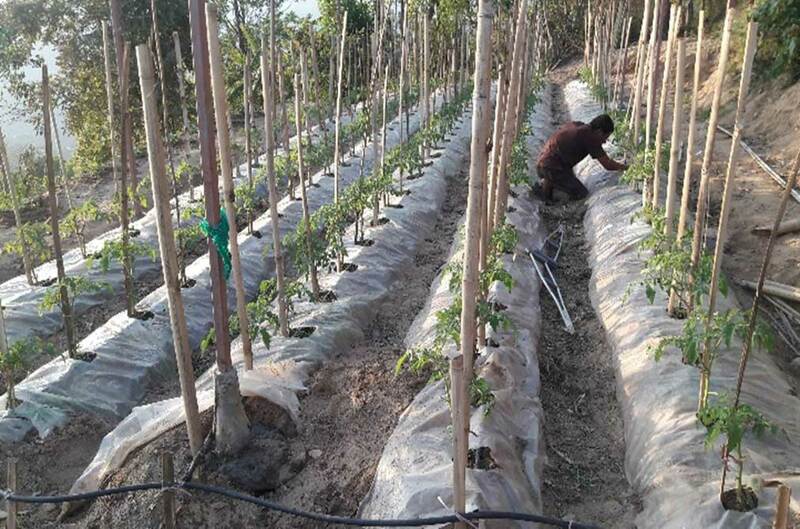 They live at Bagalephant, Purkot VDC-6, Tanahun district, located approximately 42 km North-East of Damauli, district headquarter and about 3 km from Baaisjangar, along the Dumre-Bensisahar Highway. Their survival was reliant mostly on daily labor and conventional farming. Living was indeed harsh to meet their basic needs including education of the kids. This was further aggravated by the devastating earthquake of April and May 2015. This has cost them house, ccattle shed damaged and killing one lactating buffalo. The life was never so terrible before. 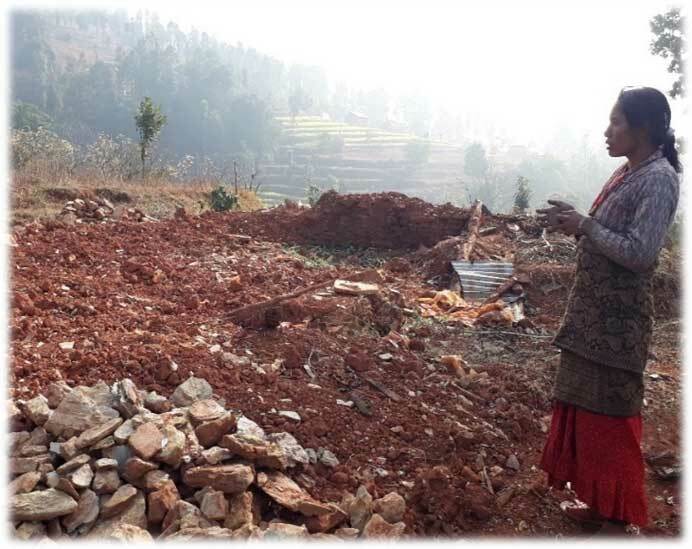 With the intervention of UKAID funded SAMARTH-NMDP’s ‘Construction of Livestock Sheds for Earthquake Affected Households for their Early Livelihood Recovery Project, she’s carefully chosen one among the victim of earthquake for construction of an improved cow shed. This support has provided them a huge encouragement to buy two improved cows. Apparently, she sales milk out for a minimum of Rs 15,000 each month in the local market besides home consumption. With the extension of Post implementation Technical Assistance (TA) Services program, she was actively involved in various training events conducted by SAPPROS viz: a) shed management, b) compost manure preparation and urine application and c) organic vegetable cultivation and kitchen gardening etc. These training have further helped to enhance her inherent capacity and wide opened the areas of income generating from fresh vegetable production by using animal wastes. 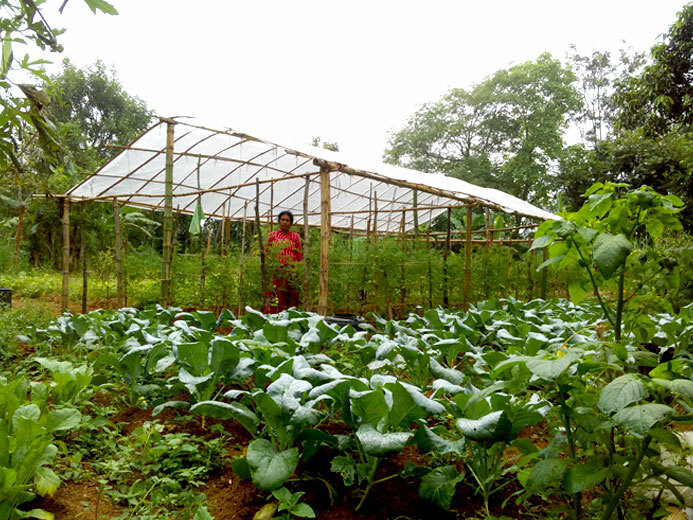 Due to engagement in a registered Kalika Agriculture Self Help Group, she was also benefitted with a plastic greenhouse support provided by Agriculture Service Centre, Purkot. SAPPROS agriculture technicians together with field facilitators have facilitated to correctly install the system as well as appropriate techniques for producing fresh vegetable in an organic way. This has enabled her to earn more than Rs 15,000 through selling of tomato and cabbage in one season. Meantime, multi variety crops can be seen under her farm areas including cucumber, bitter gourd, sponge gourd, Juccini etc. Recently, they have added two more improved cows and expected to earn even more in the days to come. These days, she speaks more confidently and says, “With these earnings, I am now capable to pursue higher education to my kids, a son is studying Overseer level (Diploma in Civil Engineering) while a daughter will be studying in the college from this year on. In addition to this, I have also paid some loan that I have taken to initiate this entrepreneurship. I would like to thank the UKAID funded SAMARTH-NMDP for their unlatching funding support and SAPPROS Nepal for providing technical assistance support. Similarly, would like to thank District Livestock Office and District Agriculture Development Office for their opportunity to uplift the livelihood of poor and earthquake affected people like us. Life was never easier before”. 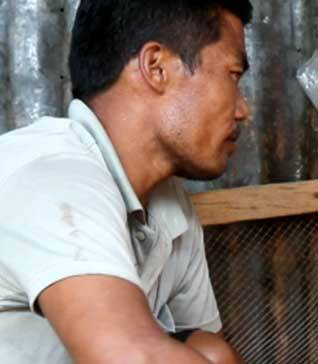 Aash Bahadur Gurung, 38, is an inhabitant of Simle, Kolki VDC 6, Lamjung district. In Nepali, the word ‘Aash’ means ‘Expectation’ in English. As name suggests, he was attracted with the growing trends of incoming remittance in the village henceforth left country in 2001 in a search for better income and prosperity. He spent almost 8 years out in Malaysia and Saudi Arab, yet he could never satisfy his basic needs despite surpassing a chunk of early active years abroad. He returned back to home country in 2014 and tried his earnings through daily labor, but failed to achieve a reliable income that he wanted for. This led him to frustration and become alcoholic most of the time for doing nothing. His situation worsened even badly when the April and May 2015 earthquake hit hard the area. Together with many others, his dwellings and cow shed were not the exceptions. He became one among the cruel victim of nature, he never expected for. SAMARTH – NMDP (UKAID funded Program) project assistance in building the improved goat shed, has shown a ray of hope in the dark. In the beginning, he started to raise with four goats and the number increased to 11 so quickly. Acknowledging his efforts, he was also provided an improved female goat from DLSO in early January 2017. He was very excited and encouraged to earn Rs 32,000 out of selling 4 goats during last Dashain. He was more benefitted with the program extension. 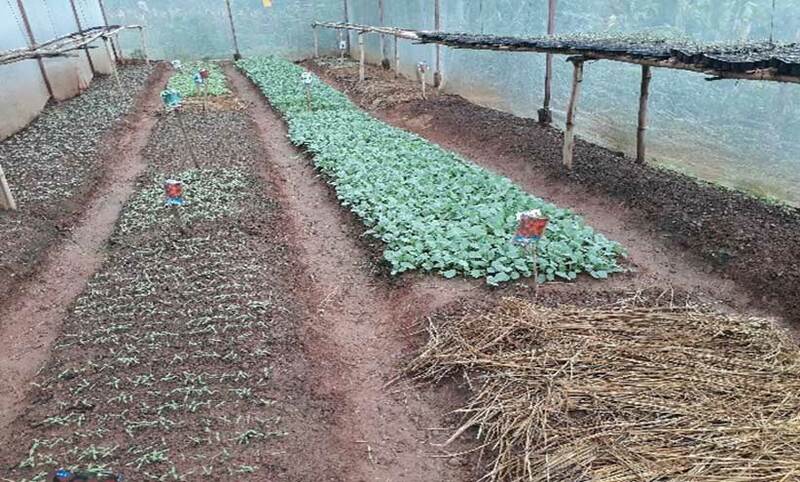 In coordination with local livestock service centre, the project helped him to enhance his skills through various training events including shed management; compost manure preparation and urine application and organic vegetable cultivation and kitchen gardening. 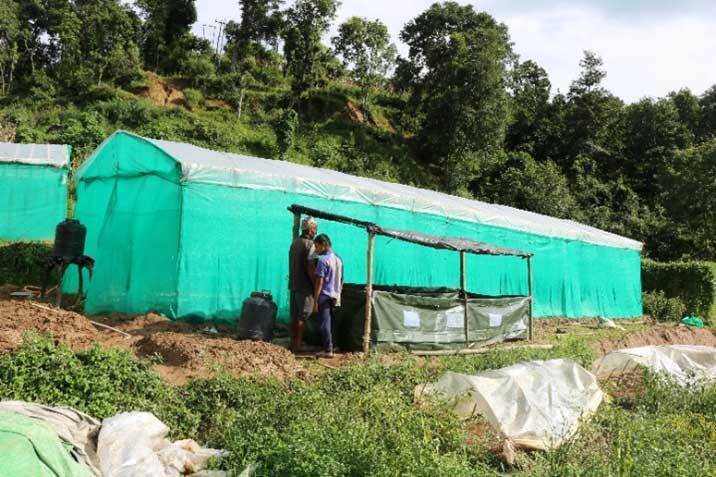 Janachetana, a local NGO, provided him plastic green house similarly SAPPROS Nepal helped him in installing it. Additionally, the organization has supported the seed and required technical backup to produce high value crops. He is using the goat wastages as fertile manure that also improved the production. He has already accumulated more than Rs 50,000 from selling tomato and cabbage. Recently, Kolki VDC council has nominated him as a model farmer in the community and allocated Rs. 25,000 to establish demo nursery plots at his farm plots. There was a time, nobody listens to or believe him doing such productive livelihood activities. His lost status was regained with his behaviour changes. Now, he is capable of managing household needs and buy education of the kids with his own income. Not only that, he is happy enough to improve nutrition intake and take care of the children closely. People started copying him. The case has been an illustrative example in the community who is roaming abroad for brighter future.